Any file or folder that you move to the Public folder can be viewed, changed, or deleted by anybody who’s using your computer or network. 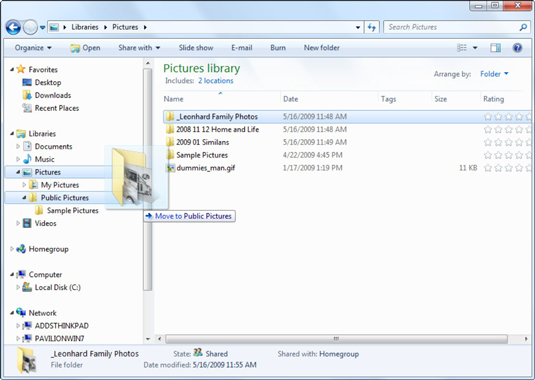 Moving a file or folder to the Public folder in Windows 7 makes it easier to share information with anyone on your PC or network. Although sharing information is great, and collaborating on documents is often the best bet, when a file or folder is in the Public folder, you don’t have any control over who accesses it or what they do with it. Be certain that you trust everyone else on the network to respect your work. Choose Start→Documents or Start→Pictures and navigate to the file or folder that you want to move into the Public folder. Use the Navigation pane to the left of the window to display the Public folder that you want to use. For example, to show the Public Pictures folder, click on Pictures. Click the folder (or file) that you want to move and drag it down to the Public folder area. Don’t release the mouse button yet. When the notification to the right of the dragging icon says Move to Public Pictures (or Documents, Music, or Videos), then you can release the mouse button. The folder moves to its new location, at which point it’s available to anybody who uses your computer and to people who connect to your computer using homegroups or networks. You can also move files and folders into the Public folder by using the traditional cut and paste method with Windows Explorer.